Our friend Amaluu over at Bollystalgia is doing a tribute to the lovely & talented Sridevi this week. Being a huge Sridevi fan myself I had to join in the fun with a review. First though, a confession - I really did not like Sridevi when I first saw her in 'Himmatwala'. I consider her one of my favorite actresses now but back then... eh. She kind of annoyed me and maybe I just didn't find the characters she played all that endearing. But there was something about her that did intrigue me and over the years I became a huge fan. So why didn't I pick one of the movies that turned me into that Sridevi fan like 'Khuda Gawah' (in which she spoke flawless Urdu and held her own against the big AB) or 'Mr. India' (one of my wife's favorite movies of all time) or even 'Judaii' (her final film in Bollywood in which she brought depth and warmth to basically a one-dimensional character)? 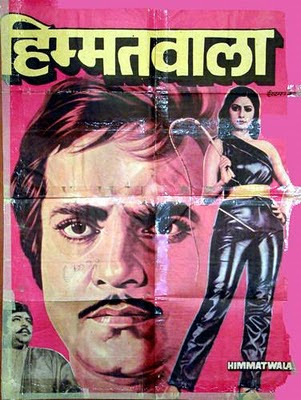 Because we here at Doc Bollywood are infatuated with beginnings and Kishore Kumar - both of which are reasons why this movie was chosen for Sridevipalooza week. Hailing from Tamil Nadu, Sridevi joins a long list of South Indian actresses who made it big in Bollywood and were known for their beauty as well as their graceful dancing abilities. Vyjayanthimala, Hema Malini, Jaya Pradha, Aishwarya Rai as well as Sridevi are just a few of the actresses from 'down under' that made it big in Bollywood. The transition was sometimes difficult as they not only had to introduce themselves to an audience that had (for the most part) never heard of them as well as master a language (Hindi) that was pretty foreign to them. In 'Himmatwala', Sridevi's entire dialogue was actually dubbed after the movie was completed as distributors were not satisfied with her pronunciation and balked at releasing the film. But as stated above, she continued to work hard at her acting as well as learning Hindi and did a pitch perfect job with the Urdu script of 'Khuda Gawah'. Her performance did not go unnoticed as she snagged a Best Actress nomination for her efforts. So weird, I was in a "Sri Devi" mood myself and started watching "Chandni" yesterday. I was (and still am) a total Sri Devi/Jeetu fan from the 80s. Infact, i used to think them two and Amitabh/Rekha were married..haha! Great song selection!! 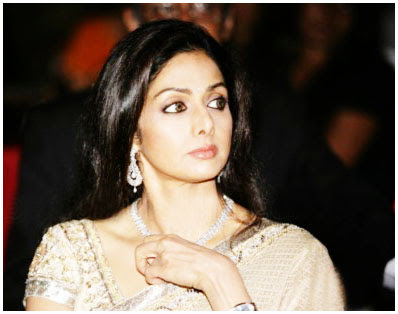 I always liked Sri Devi's acting and dancing! Her and Madhuri have the best facial expressions. My fav's from her were Chandni and Lamhe... As for the video...I remember the song but the video I don't. And I see why! I always steer clear of Sridevi and Jeetendra's films because they are always OTT. I liked her in Sadma.